In my last post I introduced the School Days raincoat. In this post I’ll to highlight the versatility of this pattern’s features and how you can use them to make a true three-season, cold-weather jacket. But what about those winter days when the temperature falls below freezing? To add additional warmth, we’ve provided pattern pieces for an insulated lining that you can make either with or without sleeves. Here’s a view of the sleeveless vest version of the liner. The lining is designed to be flexible. In addition to the vest or full-sleeve version, you can select from a variety of fabrics and insulation. Quilters who are sewing for children in more temperate climates might want to use quilting cottons and batting to create a quilted lining. Those of you living in areas where the thermometer doesn’t edge above freezing for months at a time may want to use a thicker, warmer fabric and a more contemporary (and warmer) insulation material. The choice is yours. The lining attaches to the jacket with little elastic loops that are sewn into the binding and that attach to buttons sewn onto the coat. This makes it easy to insert and remove the lining quickly. It’s not complicated to make at all. 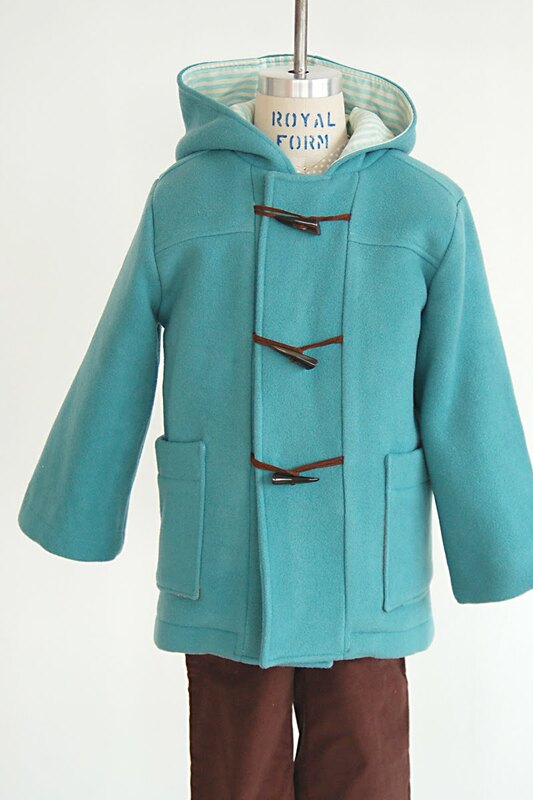 The coat can be finished with either the duffle toggles or with button tabs. 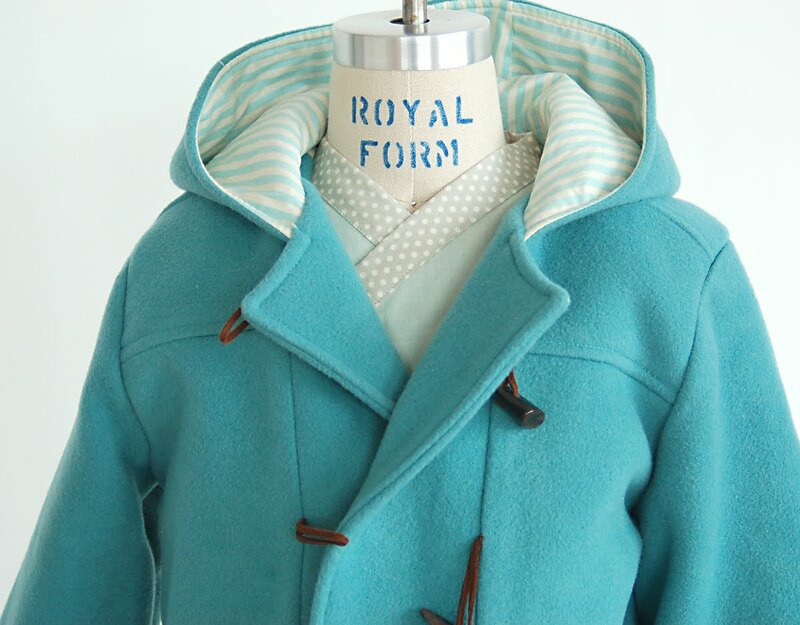 This post features a toggle version of the coat. 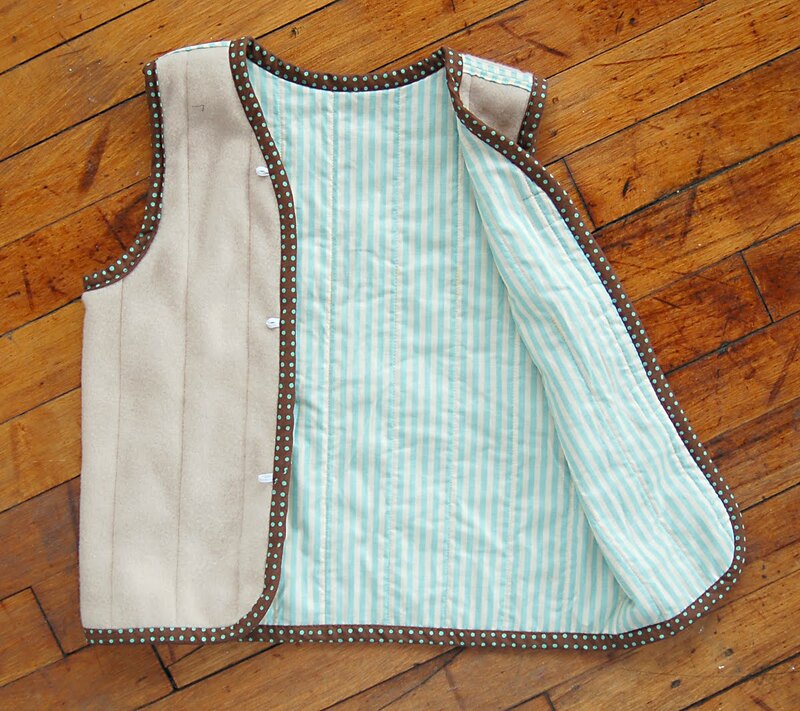 We’ll show a cute little version made using the button tabs next week. There’s one other element of the coat that I want to highlight. In addition to the button tabs or toggles, the coat features two hidden snaps to secure the coat and ensure that it stays closed against the elements. I’ve designed the coat with only two snaps, instead of the more obvious three, because many kids like to wear their coats gaping at the neck. The two snaps allow the coat to be left open at the neck and still look clean and finished. Many of you have asked for a classic, cold-weather jacket and coat pattern. I think you’ll be happy with this design, and I’m looking forward to seeing your creations start showing up in the Flickr group. Absolutely adore this! Can't wait to make one for both little ones!! Oh, Liesl… you have sincerely outdone yourself with this pattern and design. Amazing! I keep meaning to ask you – I'm looking for some good wool. Are you going to B&J; anytime soon? I so wish I could tag along with you whenever you fabric shop, just to get a glimpse of the what/where/how you put things together. Love your 'fabric selection' posts, but to actually shop with you – it would be like a class field trip. I'd bring my clipboard along to take notes! OHmygoodness… it just dawned on me. On my computer monitor the color of the coat matches your Oliver + S banner – and the brown, it's the hint of brown that your site has, too. Did you plan for that or was that your subconscious doing the fabric shopping? It's brilliant either way. OH! I want some wool that color for ME!!! But I would love to make a coat in that color for Ahnalin too. Just yummy! So cute! I just saw some O&S; at a quilt shop this week. Its the first time I've seen them in a store! I was silly levels of excited. Incredible! This post makes me more excited to have this pattern! I practically have to think of my hands thinking of the possibilites! I don't know how I'll get any work done today. 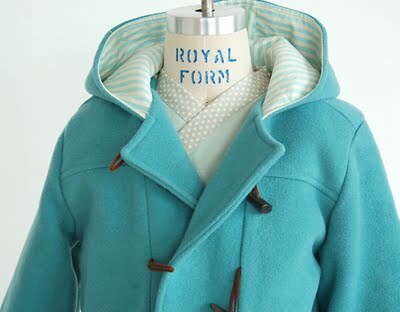 Looove that coat in that scrumptious blue. 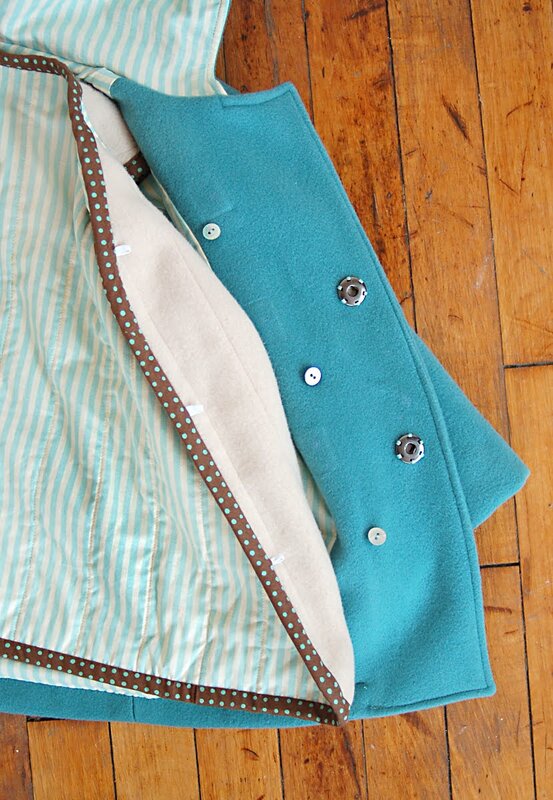 Repurposing and old coat, I like it! I like it a lot. It's hard to find wool melton around here. Perhaps repurposing a thrift store find . . . I love the idea of using an old wool adult coat to make this kid-sized one. Oh and I LOVE this shade of blue! Alright, you caught me, April. Yes, the blue is a slightly darker shade of the Oliver + S blue, and we used the brown intentionally because we'll show this sample at trade shows, etc. Likewise the brown and blue polka-dotted raincoat. Might as well color-coordinate for maximum impact, right? Gorgeous. How elegant. What a wonderful classic to keep in your wardrobe. I am impressed. Wow, fabulous. I made my son a Melton wool coat but used fleece instead to line it. Thanks for suggesting the quilting cotton as a lining as it would be less bulky and more professional looking. Awesome lining vest you have incorporated. I'm definately using this pattern for winter.